Pick your favorate NFL or MLB team! 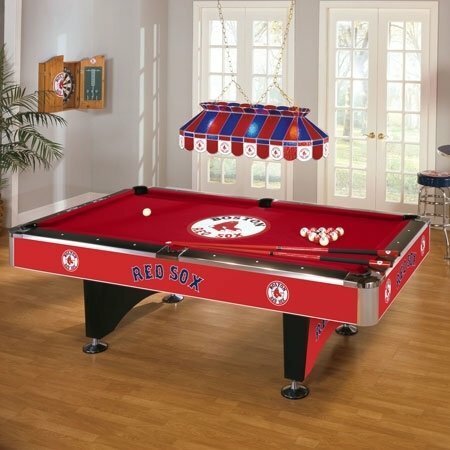 This officially licensed pool table features team graphics added onto the table using a heat bonding process. We permanently bond Lexan, which is a photo quality and scratch resistant material, to the surface of the table. The logo is reproduced clear and colorful so your team's colors are displayed proudly on your new table. Note: Team logo on center of cloth is an upgrade, see below. This 8' table has metal main beams and a 1" slate play surface. Play surface height 31"
Outside dimensions of 58" by 102", Playfield of 44" by 88"
Top Rail Cap heights of 32" and a rail width of 6 1/2"